The closest town to the border of Victoria and New South Wales on the Murray River, Customs House has a rich heritage and played an important role in the development of industry and trade in the late 1800's. Customs House was the toll for goods and services coming through South Australia on the paddle steamers. The old Customs House, at the end of Murtho Road, (24km from Paringa) was built in the 1900s and served as a excise collection point for goods crossing the Murray (the Victorian/South Australian border). It now operates as a general store. River access and boat ramp are nearby. On the Murtho Road you can take leisurely drive from Paringa near Renmark. Today Customs House is part of the Riverland Biosphere and has a great houseboat operation. This is one of the remotest parts of the Murray, it is also one of the most pristine sections. The drive to Customs House reveals an area rich in agriculture production for the Riverland region. This part of the Murray River also backs onto the Chowilla Station and floodplains. Beautiful river scenery is best experience on the river. Imagine waking up to a glassy river with a huge cliff face opposite and an abundance of unique Australian wildlife all sounded by 500 year old river gums. Starting near the old Customs House on the South Australian/Victorian border, the trail meanders through a wetland supported by the many creeks that run through the reserve. The wetland flora and fauna are highlights of this trail, especially the majestic River Red Gums and abundant birdlife. 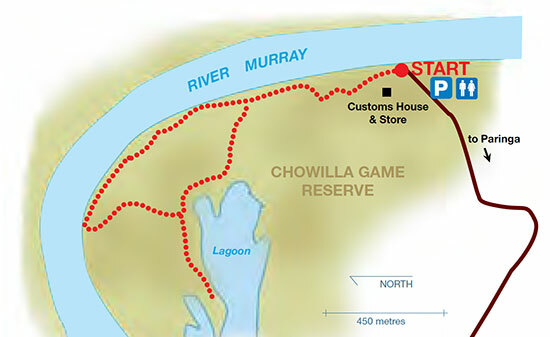 On the drive to this walk, stop at Murtho Lookout at Headings Cliffs for a spectacular view of the Murray River on the way to or from Customs House. The Black Stump is that of a massive river red gum, estimated to be nearly 600 years old is located in Murtho Road. Apex Lookout Tower, off Murtho Road, offers a vista over the Murray and Renmark and the Ral Ral Creek areas. On the way to Customs House via Murtho Road not far from Paringa is the Headings Cliff Lookout. It offers uninterrupted views of the Murray floodplain with its river red gum and box country, from the Victorian-South Australian border to Renmark. The country to the north and north-east of the lookout was to be the site of the massive Chowilla Dam. The idea was discarded in 1967, and in 1969, the alternative of Dartmouth, in Victoria, was accepted and built. Murtho Forest Reserve, Murtho Road, 15 km from Paringa, conserves the dry and wetland habitat of the area. Walking tracks wander through the reserve. River access, concrete boat ramp and bush camping are provided at Murtho Landing. 20 km north of Paringa off the Murtho Road is Lock 6. Access to the lock is by arrangement only. River access and a cement boat ramp are nearby.